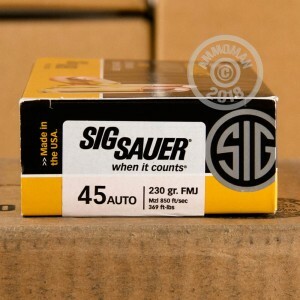 SIG Sauer's take on the classic .45 ACP cartridge features cleaner propellants to help keep your firearm working reliably and cut down on the amount of maintenance required of the owner--a welcome feature for 1911s. 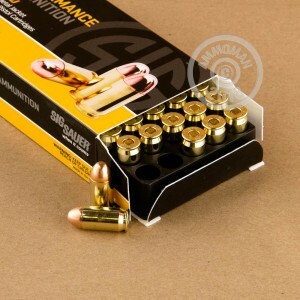 These cartridges adhere closely to traditional .45 Auto specs, firing a 230 grain full metal jacket bullet with a muzzle velocity of about 850 fps. They use non-corrosive Boxer primers and brass cases. 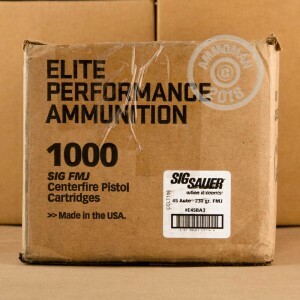 SIG designed this ammo to be reliable but inexpensive enough to shoot in quantity, so grab a few of these 50 round boxes (or any other items totaling $99 or more) from AmmoMan.com to get free shipping!